Of the estimated 160-165 million doses of influenza vaccine supplied to the U.S., approximately 74 million (45-46%) will be thimerosal-free. Product: Afluria is manufactured by CSL Limited in Australia but distributed in the U.S. by Merck. B/Brisbane/60/2008. A 0.25 mL dose contains 7.5 mcg HA of each of the same three influenza strains. The single dose presentations do not contain thimerosal. The multi-dose presentation contains thimerosal and each 0.5 mL dose contains 24.5 mcg of mercury. A single 0.5 mL dose of Afluria contains 4.1 mg sodium chloride, 80 mcg monobasic sodium phosphate, 300 mcg dibasic sodium phosphate, 20 mcg monobasic potassium phosphate, 20 mcg potassium chloride, and 1.5 mcg calcium chloride. Left over from the manufacturing process are residual amounts of sodium taurodeoxycholate (≤ 10 ppm), ovalbumin (≤ 1 mcg), neomycin sulfate (≤ 0.2 picograms [pg]), polymyxin B (≤ 0.03 pg), and beta-propiolactone. The single 0.25 mL dose contains half of all of these quantities. Indications and Usage: Afluria has been previously approved for the use in children 6 months and older and all adults, however, in light of the risk of febrile seizures observed in Australia and New Zealand in children less than 5 years old, Afluria has been suspended for use in children less than 9 years old, with the exception of 5-8 years olds whose benefit of flu vaccination outweighs the risk and no other vaccine is available. Since CSL will supply only ~12 million single doses to the U.S. (~7% of total supply), it should not be a problem to comply with this recommendation. So, the age indicated for use is ≥ 9 years old. Contraindications: Individuals with known hypersensitivity to eggs, neomycin or polymyxin, any other vaccine constituent or in anyone who has had a life-threatening reaction to previous influenza vaccine. Safety and Efficacy: Clinical trials in adults 18 to less than 65 years old demonstrated seroconversion rates of 97.8% (96.7-98.6%), 99.9% (99.5-100.0%) and 94.2% (92.7-95.6%) against H1N1, H3N2 and B influenza strains respectively. Product: Agriflu is manufactured by Novartis. Description: Agriflu is prepared from virus propagated in the allantoic cavity of embryonated hens’ eggs inoculated with an influenza virus suspension containing kanamycin and neomycin sulphate. Formulated to contain a total of 45 mcg hemagglutinin (HA) per 0.5-mL dose in the recommended ratio of 15 mcg HA of each of the following three influenza virus strains recommended for the 2010/2011 influenza season: A/California/7/2009, NYMC X-181 (H1N1); A/Victoria/210/2009, NYMC X-187 (H3N2) (an A/Perth/16/2009-like virus); and B/Brisbane/60/2008. Agriflu comes in single dose preparations that do not contain thimerosal. Indications and usage: Agriflu is approved for the use in adults ≥ 18 years old. Contraindications: Individuals with known hypersensitivity to eggs, neomycin or kanamycin, any other vaccine constituent or in anyone who has had a life-threatening reaction to previous influenza vaccine. Safety and Efficacy: In a clinical trial of adults 18-64 years old, seroconversion rates were 74% (69-78%), 72% (68-76%) and 77% (72-81%) to H1N1, H3N2 and B influenza viruses, respectively. In a clinical trial of adults 18-49 years old, seroconversion rates were 94% (93-93%), 67% (65-70%) and 84% (82-86%) H1N1, H3N2 and B influenza viruses, respectively. Please review package insert for information on adverse events. Product: Fluarix is manufactured by GlaxoSmithKlein (GSK). Description: Fluarix is prepared from influenza viruses propagated in embryonated chicken eggs. Formulated to contain 45 micrograms (mcg) hemagglutinin (HA) per 0.5-mL dose, in the recommended ratio of 15 mcg HA of each of the following 3 strains: A/California/7/2009 NYMC X-181 (H1N1), A/Victoria/210/2009 NYMC X-187 (H3N2) (an A/Perth/16/2009-like virus), and B/Brisbane/60/2008. Fluarix comes in single-dose preparations that do not contain thimerosal. Each 0.5 mL dose of Fluarix contains ≤ 0.085 mg octoxynol-10 (TRITON® X-100), ≤ 0.1 mg α-tocopheryl hydrogen succinate, and ≤ 0.415 mg polysorbate 80 (Tween 80). Left over from the manufacturing process are residual amounts of hydrocortisone (≤0.0016 mcg), gentamicin sulfate (≤0.15 mcg), ovalbumin (≤0.05 mcg), formaldehyde (≤5 mcg), and sodium deoxycholate (≤50 mcg). Indications and Usage: Fluarix is indicated for use in children ≥ 3 years old and adults. Children 3-9 years old who are unvaccinated or have only received a single dose in the previous season should receive 2 doses administered at least 4 weeks apart. Children over the age of 9 years old and adults receive only 1 dose. Contraindications: Individuals with known hypersensitivity to eggs, any other vaccine constituent or in anyone who has had a life-threatening reaction to previous influenza vaccine. Safety and Efficacy: Measurements of vaccine efficacy (seroconversion) and effectiveness (how the vaccine actually protected) were performed with the vaccine from the 2006-2007 influenza season for antigenically matched strains and also culture-confirmed flu. The effectiveness for antigenically matched strains in adults 18-64 years old was 66.9% (51.9-72.8%) and for culture-confirmed influenza, 61.6% (46-72.8%). The efficacy in adults 18-64 years old was 59.6% (56-63.1%), 61.9% (58.3-65.4%) and 77.6% (74.4-80.5%) for A/New Caledonia/20/99 (H1N1), A/Wyoming/3/2003 (H3N2) and B/Jiangsu/10/2003 strains respectively. Please review package insert for information on adverse events. Product: Flulaval is manufactured by ID Biomedical Corporation of Canada, a subsidiary of GlaxoSmithKlein (GSK). Description: Flulaval is prepared as a trivalent, split-virion, inactivated influenza virus vaccine prepared from virus propagated in the allantoic cavity of embryonated hens’ eggs. Formulated to contain 45 mcg hemagglutinin per 0.5-mL dose in the recommended ratio of 15 mcg HA of each of the following 3 strains: A/California/7/2009 NYMC X-179A (H1N1), A/Victoria/210/2009 NYMC X-187 (H3N2) (an A/Perth/16/2009-like virus), and B/Brisbane/60/2008. Flulaval is a multi-dose presentation so thimerosal is added as a preservative. Each 0.5 mL dose contains 25 mcg of mercury. A complete listing of excipients cannot be found, but left over from manufacturing are residual amounts of egg proteins (≤1 mcg ovalbumin), formaldehyde (≤25 mcg), sodium deoxycholate (≤50 mcg) and phosphate-buffered isotonic solution. Antibiotics are not used in the manufacture of this vaccine. Indications and Usage: Flulaval is indicated for use in adults ≥ 18 years old. It is estimated that GSK will be shipping ~30 million doses combined of Fluarix and Flulaval to the U.S.
Safety and Efficacy: In clinical trials of adults 18-64 years old, Flulaval demonstrated seroconversion in 85.6% (82.7% lower bound of 95% CI), 79.3% (76.1% lower bound of 95% CI) and 58.4% (54.6% lower bound of 95% CI) for A/New Caledonia/20/99 (H1N1), A/Wyoming/3/2003 (H3N2) and B/Jiangsu/10/2003 strains respectively. In a clinical trial of adults ≥50 years old, Flulaval demonstrated seroconversion in 44.8% (39.3% lower bound of 95% CI), 69.1% (63.8% lower bound of 95% CI) and 49.1% (43.5% lower bound of 95% CI) for A/New Caledonia/20/99 (H1N1), A/Wyoming/3/2003 (H3N2) and B/Jiangsu/10/2003 strains respectively. Please review package insert for information on adverse events. Product: FluMist is manufactured by MedImmune. Description: FluMist is prepared as a live, attenuated trivalent vaccine for administration by intranasal spray. The influenza virus strains in FluMist are cold-adapted which means that they grow efficiently at 25°C and restricted growth at temperatures of 37°-39°C. Specific pathogen-free (SPF) eggs are inoculated with each of the reassortant strains and incubated to allow vaccine virus replication. The allantoic fluid of these eggs is harvested, pooled and then clarified by filtration. Each pre-filled refrigerated FluMist sprayer contains a single 0.2 mL dose. Each 0.2 mL dose contains 10^6.5-7.5 FFU of live attenuated influenza virus reassortants of each of the three strains: A/California/7/2009 (H1N1), A/Perth/16/2009 (H3N2), and B/Brisbane/60/2008. Each 0.2 mL dose also contains 0.188 mg/dose monosodium glutamate, 2.00 mg/dose hydrolyzed porcine gelatin, 2.42 mg/dose arginine, 13.68 mg/dose sucrose, 2.26 mg/dose dibasic potassium phosphate, 0.96 mg/dose monobasic potassium phosphate, and less than 0.015 mg/mL gentmicin sulfate. Indications and Usage: Flumist is indicated for use in individuals 2-49 years old. It is a 0.2 mL dose vaccine that is administered intranasally (0.1 mL per nostril). Children aged 2-8 years old not previously vaccinated for influenza should receive 2 doses, at least one month apart. Children aged 2-8 years old previously vaccinated for influenza and individuals 9-49 years old should receive 1 dose. Safety and Efficacy: In a clinical study of children less than 5 years of age, FluMist demonstrated an effectiveness of 44.5% (22.4-60.6%) expressed as a reduction in culture-confirmed influenza against all matched strains of H1N1, H3N2 and B influenza. In a clinical trial of adults 18-49 years old, FluMist demonstrated an effectiveness of 10.9% (-5.1-24.4%) expressed as a reduction in one or more episodes of febrile illness. Please review package insert for information on adverse events. Product: Fluvirin is manufactured by Novartis. Description: Fluvirin is a trivalent, sub-unit (purified surface antigen) influenza virus vaccine prepared from virus propagated in the allantoic cavity of embryonated hens’ eggs inoculated with a specific type of influenza virus suspension containing neomycin and polymyxin. Formulated to contain 45 mcg hemagglutinin (HA) per 0.5-mL dose in the recommended ratio of 15 mcg HA of each of the following 3 viruses: A/Brisbane/59/2007, IVR-148 (H1N1); A/Uruguay/716/2007, NYMC X-175C (H3N2) (an A/Brisbane/10/2007-like virus); and B/Brisbane/60/2008. mercury. A complete listing of excipients cannot be found, but left over from manufacturing are residual amounts of egg proteins (≤ 1 mcg ovalbumin), polymyxin (≤ 3.75 mcg), neomycin (≤ 2.5 mcg), betapropiolactone (not more than 0.5 mcg), phosphate-buffered isotonic solution (≤ 1.0 mcg and nonylphenol ethoxylate (not more than 0.015% w/v). Indications and Usage: Fluvirin is indicated for the use in individuals ≥ 4 years old. Children 4-8 years old who are unvaccinated for influenza or have only received one dose the previous year should receive 2 doses, at least 4 weeks apart. Children 4-8 years old who have previously received 2 doses of influenza vaccine, children ≥ 9 years old and adults should receive 1 dose. It is estimated that Novartis will be supplying the U.S. with ~40 million doses of Fluvirin. Safety and Efficacy: Numerous, small clinical studies conducted on adults 18-64 years old demonstrated a wide range of seroconversion rates depending upon year and strain. The ranges with 95% CI were 55% (44-67%) - 73% (62-83%), 61% (50-72%) - 90% (86-93%) and 56% (45-67%) - 74% (65-82%) for H1N1, H3N2 and B strains respectively. Please review package insert for information on adverse events. Product: Fluzone is manufactured by Sanofi Pasteur and comes in three presentations. Fluzone High-Dose is new this year. Description: Fluzone and Fluzone High-Dose are inactivated influenza virus vaccines prepared from influenza viruses propagated in embryonated chicken eggs. They are formulated to contain the amount of HA per dose for each of the three influenza strains recommended for the 2010-2011 Northern Hemisphere influenza season: A/California/07/2009 X-179A (H1N1), A/Victoria/210/2009 X-187 (an A/Perth/16/2009-like virus) (H3N2), and B/Brisbane/60/2008. Paediatric Fluzone: Is a 0.25 mL dose containing 22.5 mcg HA total; 7.5 mcg each of H1N1 HA, H3N2 HA and B HA. (quantity sufficient for appropriate volume) Sodium phosphate-buffered isotonic sodium chloride solution, ≤50 mcg formaldehyde, ≤50 mcg octylphenol ethoxylate (Triton® X-100) and 0.05% gelatin. Fluzone paediatric comes in single-dose, pre-filled syringes and do not contain thimerosal. 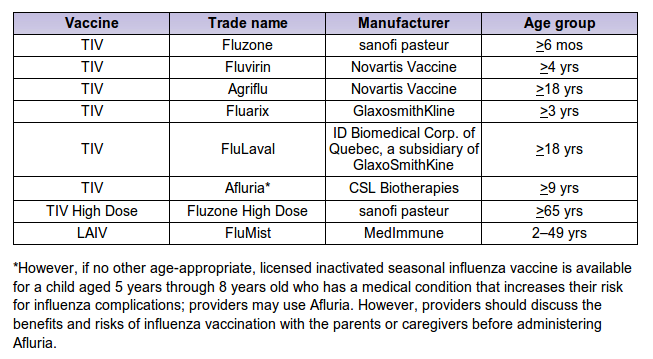 Fluzone presented in a multi-dose (for use in individuals ≥ 6 months old) vial does contain thimerosal and contains 12.5 mcg mercury per 0.25 mL dose. Fluzone: Is a 0.5 mL dose containing 45 mcg HA total; 15 mcg each of H1N1 HA, H3N2 HA and B HA. (quantity sufficient for appropriate volume) Sodium phosphate-buffered isotonic sodium chloride solution, ≤100 mcg formaldehyde, ≤100 mcg octylphenol ethoxylate (Triton® X-100) and 0.05% gelatin. Fluzone comes in single-dose presentations that do not contain thimerosal and multi-dose vials that contain 25 mcg mercury per 0.5 mL dose. Fluzone High-Dose: Is a 0.5 mL dose containing 180 mcg HA total; 60 mcg each of H1N1 HA, H3N2 HA and B HA. (quantity sufficient for appropriate volume) Sodium phosphate-buffered isotonic sodium chloride solution, ≤100 mcg formaldehyde, ≤250 mcg octylphenol ethoxylate (Triton® X-100) and no gelatin. Fluzone High-Dose comes in a single-dose, pre-filled syringe presentation that does not contain thimerosal. Indications and Usage: Fluzone is indicated for the use in individuals ≥ 6 months old and adults less than 65 years old. Children 6 - 35 months old, unvaccinated with influenza or receipt of 1 dose in the previous year should receive 2 0.25 mL doses, at least 1 month apart. Children 36 months - 8 years old, unvaccinated with influenza or receipt of 1 dose in the previous year should receive 2 0.5 mL doses, at least 1 month apart. Individuals ≥ 9 years old should receive 1 0.5 mL dose. Fluzone High-Dose is indicated for the use in individuals ≥ 65 years old and should receive 1 dose. 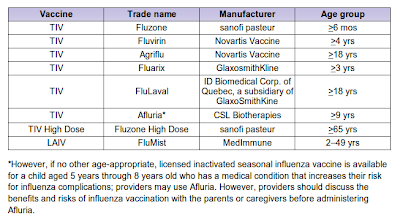 Sanofi Pasteur announced that ~70 million doses of Fluzone will be supplied to the U.S.
Safety and Efficacy: In one very small paediatric study, children 6 - 36 months old, after 2 doses, demonstrated seroconversion rates of 77%, 77% and 48% to H1N1, H3N2 and B influenza strains respectively. Small, clinical studies of adults 19 - 59 years old demonstrated seroconversion ranges of 49-54%, 72-79% and 38% to H1N1, H3N2 and B influenza strains respectively. In adults 61-86 years old demonstrated seroconversion ranges of 23-38%, 68-70% and 10-11% to H1N1, H3N2 and B influenza strains respectively. Fluzone High-Dose in adults 65-97 years old demonstrated seroconversion rates of 48.6%, 69.1% and 41.8% to H1N1, H3N2 and B influenza strains respectively. Please review package insert for information on adverse events. Pregnant women or women who will become pregnant during influenza season may be concerned about influenza infection and vaccine safety during their pregnancies. Ideally, women who are thinking about becoming pregnant should consider flu vaccination prior to conception. However, that is not always an option. In Influenza infection and vaccination in pregnant women, Tamma et al. reviewed numerous studies regarding the effect of influenza infection and vaccination on pregnant women and neonates. Transplacental transmission of influenza virus and teratogenic effects remain unclear, however, there is evidence that an indirect effect of maternal influenza infection on adverse foetal development may occur via the maternal immune response (proinflammatory cytokine production) during hypothermia, particularly in the first trimester. It has been postulated that influenza vaccines could do the same, however first, influenza vaccines administered to pregnant women are inactivated and next, a study by Munoz et al. (2005), failed to find any differences in adverse pregnancy outcomes and infant health (study period of 6 months post-partum) in a cohort of vaccinated pregnant (in second or third trimester) women versus unvaccinated, healthy pregnant women. Additionally, no unusual adverse outcomes occurred in the vaccinated group that could be attributed to influenza vaccine. There appears to be protective effects for the neonate in influenza vaccinated mothers as well. Zamen et al. (2008) reported a 63% reduction in laboratory confirmed influenza in infants less than 6 months old born to mothers that were vaccinated for influenza during pregnancy as compared to a Pneumovax-vaccinated control group. Although both groups were vaccinated, there were no adverse outcomes that differed from the general population during that time. While sick, limit contact with others as much as possible to keep from infecting them. Utilise N-95 masks to prevent transmission of flu. Stay healthy by eating right, this includes supplementation with vitamin D3, which may help to reduce influenza disease effects. Pregnant women need to ensure adequate folic acid intake.